This shot was taken from the top floor of the now abandoned Maharishi Mahesh Yogi’s ashram in Rishikesh, India. The man-made beehive structure is a chamber for transcendental meditation, designed to focus your thoughts and prayers more effectively (ahem). The other beehive is bee-made, and very nicely placed to form a curious juxtaposition and uncannily fortunate symmetry. The hovering bee, waiting, it seems, to dock with the mothership, was a neatly-timed addition to a set-up that seemed too good to be true. The ashram was abandoned in 1997 due to an expansion of the national forest on which it bordered. The place was simply locked up and left to nature, with no real attempt to demolish or dismantle the structures. I visited the place in 2010 with a cool Canadienne I met at the end of an unexpectedly epic eleven-hour journey from Delhi – Kumb Mela was on at the time in Haridwar, a mere ten kilometres from Rishikesh, and the roads were choked with millions of pilgrims. Rishikesh itself was flooded to the gills with saffron-robed holy folk and it was a constant pleasure to walk among them, curious sight that they were. There weren’t any guards or attendants at the entrance to the ashram, but there was a gate-keeper of sorts; a lame young bloke with a pair of crutches. He “let us in” for a couple of hundred rupees and once inside we were free to roam about. It wasn’t long before we were met by a long, white-bearded former ashram guest named, I think, Mohan (? ), who offered himself as a guide in such a friendly manner that we accepted his offer immediately. Mohan had spent his life working as a high-level public servant in the transport sector and now, in retirement, he had taken to wandering around India like a holy man. Clearly, having spent years at the ashram in the 80s, he was pursuing a long-standing inclination. Mohan led us along the leaf-strewn paths, through the curious overgrown structures. Most of the buildings were sturdily stone and concrete built, and where they were damaged it was largely through having been looted for fittings. He took us to the four beehive huts where the Beatles had stayed, numbered 7 through 10, if I remember correctly, with John Lennon having been in number 9. Alyne and I had a few great fan-boy moments, exploring and taking photos, quietly contemplating along with excitedly chatting about the rock n roll history of the place. In one of the buildings we explored, Beatles fans had painted murals in the abandoned rooms, depicting Beatles themes and lyrics. These had a lovingly amateur quality to them, somehow appropriate considering the stylised charm of the Beatles’ own cartoons. Eventually, we came to the largest structure on the site – a three-storey concrete mass with more beehive domes on the roof. 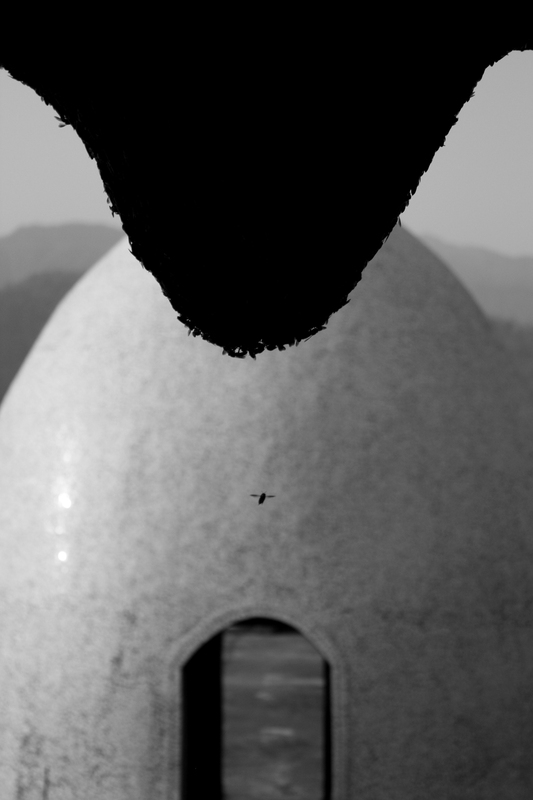 It was in this building that I came across this actual bee hive, looking out across the low foothills towards the gorge cut by the Ganges. Its context in the derelict human structure offers a sense of caveat and foreboding – as though a prelude to the fall of civilization. It also reminds me of an important thing to bear in mind when contemplating human civilization – that, of course, the human beehive is natural too. It’s just a more elaborate nest.